Why can’t more affordable housing look this good? Yes, this is affordable housing! It’s one development that visually stood out from the Smart Growth Illustrated set of case studies highlighted yesterday. In Aspen, Colorado, the wealthy bid up the prices of homes in the city (average home price of $1.7 million – that’s not a typo! ), resulting in traffic jams and air pollution from the commuting employees who couldn’t afford to live there. It’s so bad that it’s nationally known as the Aspen effect. The developer, Curtis/Affordable Housing Development Corporation (an affiliate of the Jonathan Rose Companies) and the City of Aspen partnered to develop Benedict Commons, 27 units of housing for the employees. Hey, it’s a start. The community is designed for residents earning $17K-$38K, the studio and 1BRs originally sold for $57K to $130K, and the resale price of the units can only rise at the rate of the Consumer Price Index. The design genius of the project is that it’s designed to look like half the density it really is. What would you guess it is? 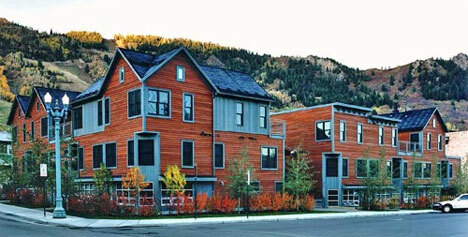 The variations in facade, roofs, windows and soft building materials give it the appearance of single-family homes. The density is 78.4 units/acre. And of course, it follows green building principles: super insulation, Low-E glass, cross-ventilation, recycled building materials, and south-facing interior courtyard providing passive solar heat.